2kBryy & Quanny6ix are 2 upcoming teenage rappers that live in Daytona Beach Fl. Inspired by artists such as Duwap kaine, Lil yachty rich the kid, 21 savage and Playboi carti. 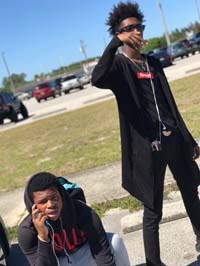 2kbryy is originally from Fayetteville North Carolina but moved to a few different states such as Florida, Georgia, and Kansas .Quanny6ix is originally from Rochester New York and moved to Florida. We just started rapping and taking it serious about a month ago and people are really messing with it in our area we’re just trying to expand now. We like to rap about turnt stuff that makes you wanna go wild. We are a mixture of Trap and bubblegum trap and have different flows in every song .